Madhumita Bisht hails from West Bengal and she was born on 5th October, 1964. If you are a badminton fan and you like watching it on television, you may have seen Madhumita because she is a famous Badminton personality. You may have seen her jumping up and down, praying to god and breaking down into tears of happiness. Yes, we are talking about the former Badminton player, Madhumita Bisht. Here is a treat for all her fans. If you wish to know more about the former star badminton champion, this article will tell you all about her. She was born in Jalpaiguri, West Bengal. She was born as Madhumita Goswami as she belongs to Bengal. She recalls that she used to pick up the racket and start playing at the age of 10. Her father used to encourage her to play and reach the top. He would tie her shoe laces as well. He used to give her a quick oil massage before the game and he never let her give up. To think that there are some parents, who do not encourage the girl child to go out at night and chase their dreams. Madhumita’s father was supportive and he used to encourage her to play it professionally. She got married in the year 1983 to a badminton champion named Vikram Bisht. He never stopped her from playing the game because they both in the same field. She used to play and win medals still! In the year 1993, she had a son named Harshvardhan. Did you know that Prakash Padukone wrote a letter to Madhumita saying, “Welcome to sleepless nights’’. She used to juggle between family and the game. However, she did not have a tough time because her husband was supportive. She started to play when she was just 10 years old. As she grew up, she knew what she wanted to become. She has received Arjuna Award for badminton. She is the Chief Coach for the Indian Team now. All the badminton players have their own personal coaches but they still look up to Madhumita for guidance. At the age of 50+, she is still energetic and full of enthusiasm. She made sacrifices for her career such as not having a baby for ten years. She gave up on socializing and maintained proper diet. However, she does not regret anything at all because she earned every single achievement of hers. She earned 29 national titles and she is a true champ. 8 times National singles champion. 12 times mixed doubles winner. She had a bright International career also. She won many titles back home and abroad as well. She won the bronze medal in the Asian Games 1982 in Delhi. In the year 1992, the world ranking of Madhumita was 29. 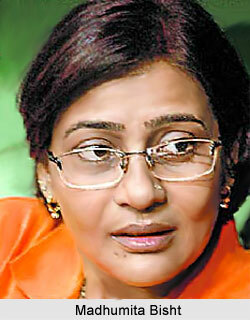 Once she announced that she retiring, she became the coach of Indian Railways. In the year 2012, she and her husband started a badminton coaching academy. It is called MV Bisht Academy. You will find three academies in Delhi. It is the best and it trains individuals to become fine badminton players. It is true that giving up can be hazardous for your will power. You should believe in your heart that you can achieve your dreams. If you give up too early, you will never realize your dreams. She believed she could do it and she never gave up. She has been the most dedicated player, who never gave up on her career for family or even after marriage. She is an inspiring lady and many young badminton players look up to her. Madhumita Bisht may be retired but even when she is seen around the badminton court, people still see a dazzling smile on her face. She spent many years on this game and even today, she continues to contribute to the field of badminton through the academy and coaching. We salute women, who are not afraid to chase their dreams!